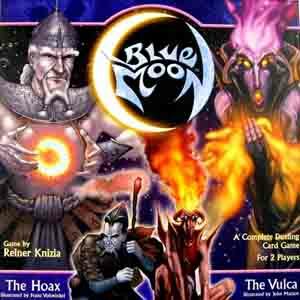 In Blue Moon you take control over one of the peoples of the world Blue Moon. Your aim is to attract the three elemental dragons in direct confrontation against one of the other peoples. To achieve this goal, each round one of your characters is sent to fight against one of your opponent‘s characters. Each people has various sources of support and boosters available, to finally enforce the enemy to withdraw and, by doing so, to attract one or more dragons. As the leader of your people you can also intervene directly. The basic game contains the „Hoax“ and the „Vulca“. Right now there are also two seperate sets available: The „Mimix“ and the „Flit“. More seperate people sets are currently in preparation: „Terrah“, „Aqua“, „Pillar“ and „Khind“.